In 1900, the railway that would link European Russia with the Pacific coast was near completion, an accomplishment that brought Nicholas great satisfaction and the support of his country. 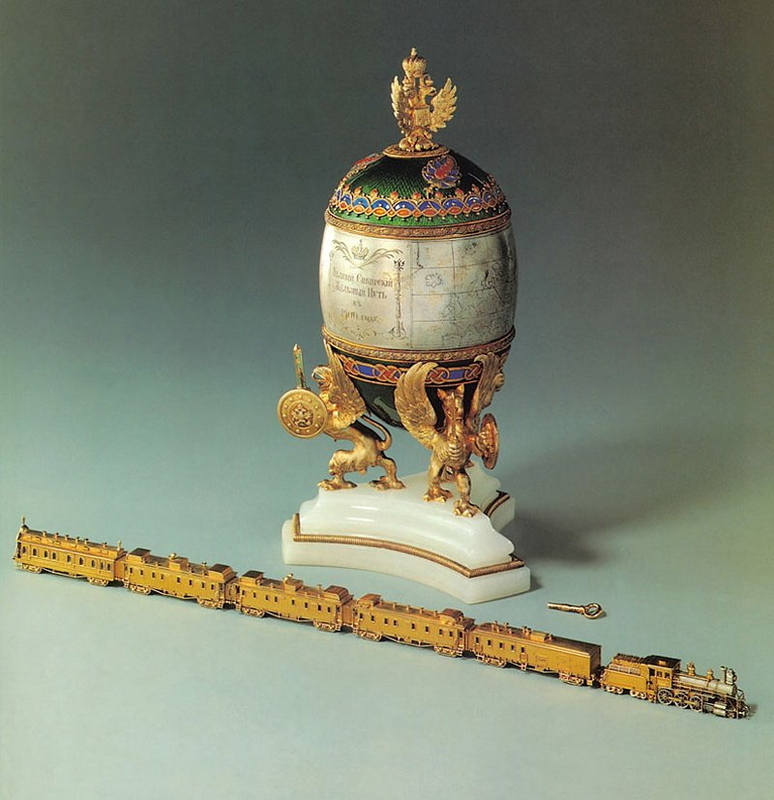 Fabergé devised an ingenious offering to celebrate the event: a translucent green enamelled gold Easter egg decorated with colored enamel and mounted on an onyx base. 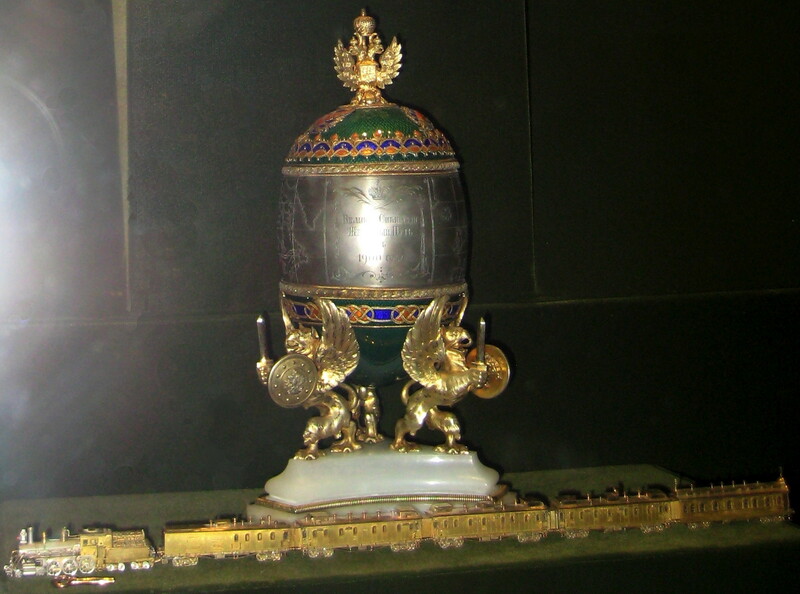 The lid of the egg is hinged, has an overlay of green enamel, and is decorated with inlaid leaves of acanthus. 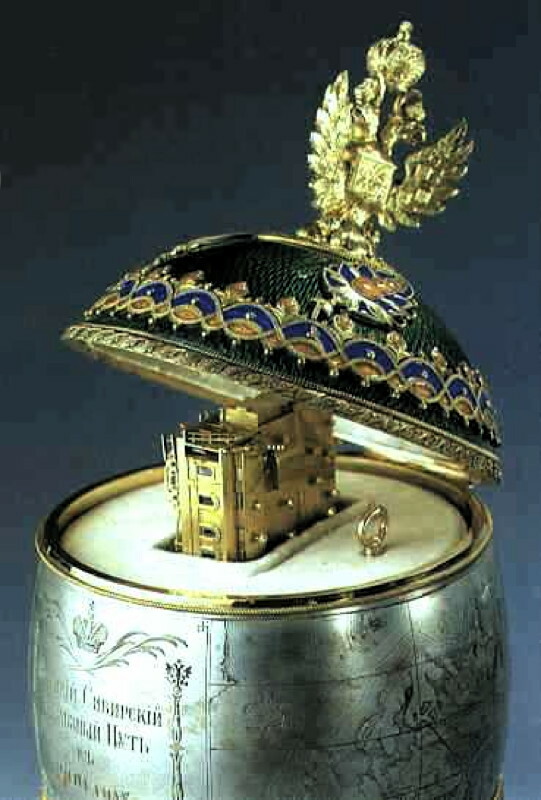 Surmounting the lid is a three-headed Eagle in gold bearing the Imperial Crown. Engraved in silver across the egg is a map of the route of the Trans-Siberian railway, which ran from St. Petersburg to Vladivostock. Each station is marked by a precious stone. This map forms a broad belt around this translucent green enamelled gold egg. It is decorated with blue and orange enamel mounts and bears the inscription "The route of the Grand Siberian Railway in the year 1900." 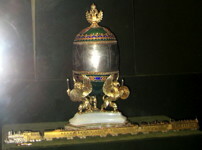 The egg is supported by three Romanov Griffins cast in gold-plated silver, each brandishing a sword and shield. The stepped base is of white onyx in the form of a triangle with concave sides and rounded corners. A gold-plated silver braid is inlaid into the base. Within is concealed, in three sections, a miniature working model of the Trans-Siberian Express just 39,8 cm long. It consists of a platinum and gold locomotive and tender, and of five gold coaches with windows of rock crystal. Its headlights are diamonds, and its rear lights are rubies. The three parts may be connected to form a train which runs along when the clockwork locomotive is wound up. The coaches are individually labeled "direct Siberian mail", "for ladies only", "smoking" and "non-smoking", and a "restaurant" car. Then on the second - "second class", "24 places", and on the third and fourth - "first class", "18 places". The last coach is designated "chapel", which was appended to the Imperial train. The train runs when is wound up with a golden key above the driving wheels of the locomotive.